Digital Music Package Design by mr.soul for DefJam recording artist August Alsina's debut album, "Testimony". An artist known as "mr.soul"—a name given to him by a client long ago—has developed as an artist ever since he was a boy growing up in the Lee-Harvard neighborhood. “I’ve been into art my entire life,” he says. 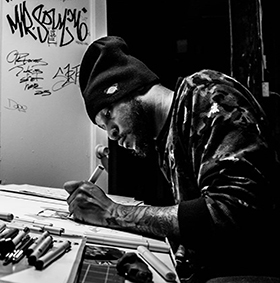 Twenty years ago, mr.soul moved to Atlanta and thrived as a graphic artist in the city’s music and entertainment industry, helping to establish Atlanta’s famed City of Ink tattoo shop and traveling urban art and music exhibition Art+Beats+Lyrics, among other endeavors. Furthermore, while in Atlanta, mr.soul was involved with Black youth-driven artist collectives that attracted and supported a diverse group of artists, while in Cleveland he sees a huge gap in racial diversity, equity, and younger people being involved in the decision-making process. Around the time mr.soul returned to Cleveland, Cuyahoga Arts & Culture (CAC) was also realizing the same racial inequities among Cleveland artists. In fact, racial equity and diversity has been a priority for CAC as it moves into its second decade of publicly-funded arts and cultural programming. The artist spoke in February 2017 at a CAC board meeting, at which he also heard similar views on the support Cleveland artists received. After talking to CAC executive director Karen Gahl-Mills, he was asked to join CAC’s Support for Artists Planning Team (SfAPT), formed last May. SfAPT is comprised of 10 artists and community leaders, as well as CAC manager of special projects and communications Jacob Sinatra and board member Gwen Garth. The team was charged with making recommendations for ensuring equity in its funding and support of individual artists, creating a trusted dialogue between CAC and artists, and establishing trust. The team—along with a facilitator team from Case Western Reserve University’s Community Innovation Network, led by co-facilitators Mark Chupp and Jerry Pena—began meeting twice a month last June to address equity and diversity issues and make recommendations to the CAC board for ways to better support and fund individual artists in Cuyahoga County. Chupp and Peña kept the discussions open, attempting to diffuse any tensions that rose too high. “When differences arose, we worked to help members hear each other, respect their differences, and continue to be in dialogue around their different perspectives,” says Chupp. mr.soul says this first recommendation holds the most weight. “It forces the always uncomfortable conversation about race, privilege and what is going to be required to truly achieve the equity and fairness balance that the CAC seeks in moving forward with their program,” he says. The list goes on to recommend programs for artist support, professional development, and availability of physical space for artists to pursue their works. Ultimately, the team recommended CAC monitor their practices moving forward, stating, “SfAPT recommends that CAC retain a diverse team, including members of the planning team, throughout the implementation of these recommendations as a sounding board to consult on how these recommendations get brought to life." The CAC board formally received the SfAPT recommendations on Tuesday, Dec. 11 and is now forming a work plan to implement the recommendations in 2018. Based on the SfAPT's final recommendation—to maintain a diverse team through implementation—Sinatra says the board has charged the CAC staff with drafting a plan and soliciting feedback from a panel, which will include many of the SfAPT members. This group will evaluate the options for implementation and return to the board in February. At the meeting, the CAC board also approved the 2018 operating budget, which allocates $400,000 toward individual artist programming. Sinatra says this money may be earmarked for fellowships, mini-grants, professional development, or other programs that support equity in arts and culture. Chupp says he is impressed with the recommendations, noting that they also reflect the team’s deeper understanding of the equity issues at play. From 2009 to 2016, CAC had a Creative Workforce Fellowship program in place to help fund Cuyahoga County artists. In that time, CAC issued $4 million in fellowships to 161 artists. However, when the organization ended the program in 2016 to make way for a more collaborative support model, officials realized that only 16 artists in the group identified themselves as African-American or Black. It was a crucial realization. The fellowship program, which was administered by Community Partnership for Arts and Culture (CPAC), was not designed to allot fellowships based on personally identifying criteria, but CPAC did collect demographic data from applicants. The SfAPT is made up a diverse group— five African-Americans, three Caucasians, one Asian, and one Latina. “We intentionally recruited a team that was not only racially diverse, but included a majority of people of color and was diverse across geography, artistic discipline, and gender,” says Sinatra. Furthermore, Sinatra estimates the team ranged in age from about mid-20s to mid-60s. “The team was intentionally composed of a majority of working artists – who make at least half of their income from artmaking, creative practice or business,” he says, adding that middle school and high school students also gave input during a CAC event in September. While the team was purposely diverse, there also was a great deal of tension among the group members over topics of racism and equity, says Sinatra. The group remained open-minded, and kept their conversations on the issues open and honest to address the concerns. The group also participated in racial equity training to get everyone on the same page. 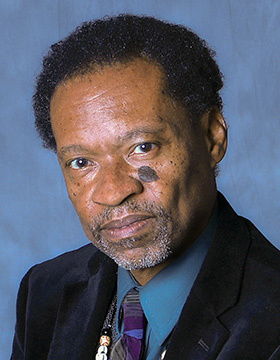 Vince Robinson is a photographer, poet, author, and television and radio host, as well as front man for the band Vince Robinson & the Jazz Poets and co-owner of Larchmere Arts. He got involved with CAC last year after attending several community meetings in his neighborhood. Robinson had applied for the CAC fellowship in the past, and says he identified himself as a person of color, and was rejected, so he had a particular interest in being part of the conversation. He notes that Cleveland has long had a reputation for being a segregated city, and he saw the SfAPT as a way to address many of the barriers that keep aspiring artists from succeeding. “We recognize artists at their different levels of evolution as artists,” Robinson explains. “It’s about creating a friendly environment for artists and people who are working at becoming artists." These issues are why the SfAPT included recommendations to foster institutional connections, develop physical spaces that support artists, and opportunities for professional development. mr.soul says he sees the recommendation to prioritize funding to people who have historically been excluded as the top outcome from the list. But in the end, mr.soul says the group could agree on most things. “The cream rose to the top, and we were able to put these recommendations together and learn to get along as a group,” he says. Despite periods of tension, both mr.soul and Robinson are also hopeful that SfAPT’s recommendations will propel CAC forward on a positive path. In May 2017, Cuyahoga Arts & Culture (CAC) assembled a team of 10 artists, leaders and educators in the arts to form the Support for Artists Planning Team (SfAPT), a group charged with assessing the way CAC supports individual artists and how the organization could better aid, fund and offer programming to a diverse group of individual artists in Cuyahoga County. Below are the recommendations the SfAPT presented to the CAC board on Tuesday, Dec. 5. Funding: Throughout all support for artists, SfAPT recommends the majority of funding and support for individual artists goes to Cuyahoga County residents who have been historically excluded, namely persons of color (African American, Black, Latino/a, Asian, Arab, Native American). We also recommend the prioritization of those who have been excluded based on gender, geography, age, income, sexual orientation, or education. Accountability: SfAPT recommends that CAC begin on its new path to equitable funding by issuing a public apology for its’ past funding practices for individual artists, acknowledging the difference in perception, challenges in having a public conversation about racial equity, and setting a precedent for holding itself and the region accountable toward racial equity. Meaningful unrestricted monetary support to recognize artists for their work: SfAPT recommends that CAC provide non-specific/unrestricted monetary support through the awarding of Individual Artist Fellowships, meant to reward artists for their work and their connection to the community. Fellowship artists will have the opportunity to contribute to a cohort model of building unity in the local arts community. Specific project support: SfAPT recommends that CAC provide monetary support for specific projects or ideas and enable artists to create, connect, and share their work. This support is designed to provide artists the monetary support, tools, training, travel or other resources necessary to bring a project or idea to life in the community. Develop physical spaces that support artists: CAC should support and offer brick and mortar artists spaces throughout the County, with a focus on historically excluded areas of the City. The need is two-fold: to create new spaces and activate and expand access to existing spaces. Foster institutional connections to local artists: SfAPT recommends that CAC provides opportunities and resources for artists who receive support so that they can connect to and access CAC supported institutions in ways that complement their existing infrastructure and/or challenge them to develop new practices. 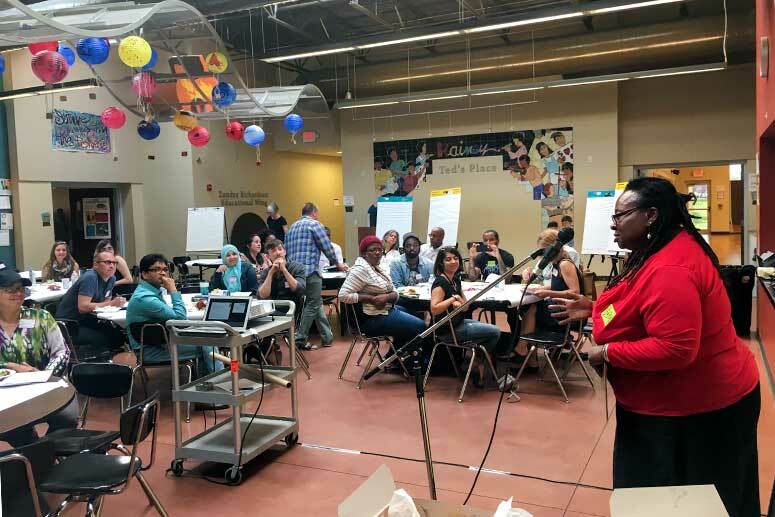 Professional development: SfAPT recommends that CAC provides professional development support for artists to empower them, help them grow, and connect them to other artists, residents, and opportunities in Cuyahoga County. Monitoring implementation: In addition, SfAPT recommends that CAC retain a diverse team, including members of the planning team, throughout the implementation of these recommendations as a sounding board to consult on how these recommendations get brought to life.